Gunite is a type of concrete that has been used for swimming pool construction for more than 30 years! This type of concrete is pumped and sprayed over a steel frame. It is much stronger than concrete that is casted in place. A 6-inch by 6-inch row of frost-proof tile is installed along the top edge. A ¼ - ½ inch layer of marblite (a plaster-like material) is trowled over the gunite. The marblite comes in colors from bright white to black. This gorgeous formal pool and garden sits off the dining room. It was built in the 1960's. I redesigned it in 1991. The pool surface is a soft gray that gives the landscape design a muted, tranquil feeling. The pool is left open all year because it's a pleasure to view from the house. The owners don't want a cover to distract from the overall impact this garden has on the views from the house. A black pool surface gives the water a reflective quality like a mirror. It can make a simple pool look very dramatic. If you want a pool that looks bright, clear and blue use a white surface. Gray surfaces look soft. A sylvan green surface looks like a pond. As you can see, the surface color can impact the landscape design considerably. The black surface contrasts beautifully with the bright red furnishings! What a dynamic landscape design statement! The selection of frost-proof tiles for pools has gotten extensive. 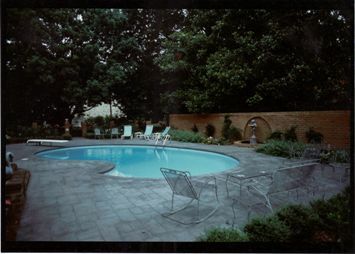 Just the right color tile can add a unique detail to your pool. Glass tiles that are translucent and colorful are fairly new and extremely popular. On a classic style brick home, I’ve used Buckingham slate tiles that give a dark gray color and the look of natural stone. Stone and brick always complement one another. Ceramic tiles have taken on new color palettes and textures. Just be absolutely sure that the tile is for exterior use, so it’ll hold up to freezing temperatures. Automatic covers are an accessory that can be installed on a pool. At the push of a button the cover travels along a small track that is inconspicuously installed below the coping. The cover keeps debris out of the pool. It’s also a safety feature to assure no one enters when you’re not around. For a heated pool, it can help on the costs of heating by keeping it covered when not in use. 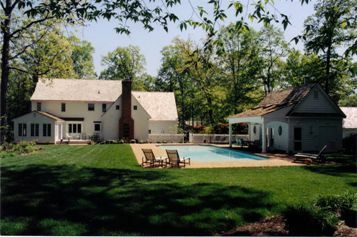 On my projects, I’ve only had them installed over rectangular-shaped, gunite pools. However, they are available for other shapes and types of pools. The white surface shines like the pretty white pool house and main house! 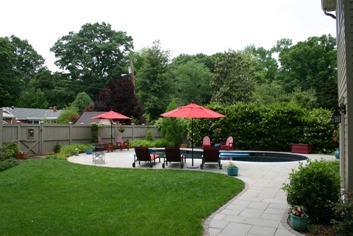 Gunite pools are very versatile and so attractive! They can have seats molded into the sides that are also used for steps. These benches, also called swim outs, can be used for exiting the pool instead of an aluminum step letter. Hot tubs can be installed off one side and made to flow into the pool. For a sloped property, they can be built to be on multiple levels. The striking vanishing edge pool is usually made out of this material. Formal designed pools can have fountain jets that spray water across the pool. Their applications are endless to a creative mind! Have questions? I have answers! Ask a question and you will get a quick response and a page on this site to share the information with friends and readers. I hope to be hearing from you!